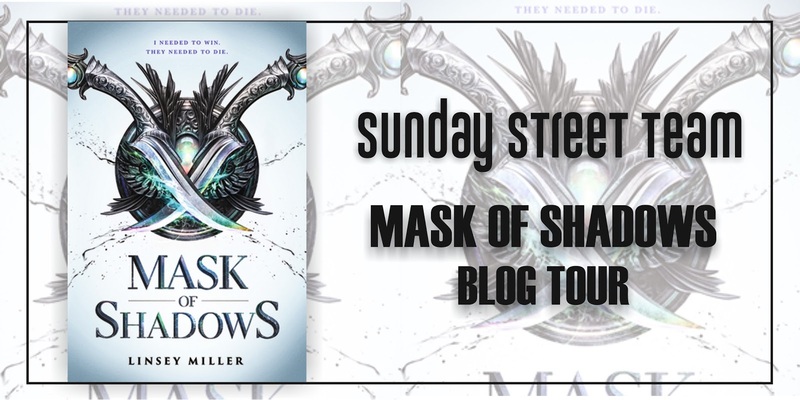 Welcome to my Tour Stop on the Mask Of Shadows by Linsey Milley Blog Tour organised by the Sunday Street Team! I first heard about this book on NetGalley and I fell in love with the description. A gender fluid thief in a tournament to become an assassin for the queen? SO SO COOL. I found out in August that I would be receiving a physical ARC and I FREAKED OUT! I was so excited that I actually won a giveaway and I waited for it to get here before I started reading. It got here last weekend and I JUST finished reading it for the tour. Don't forget to enter the giveaway too! Long Story Short: This was a good book, fast paced and filled with its fair share of action scenes but there was something missing, specifically the lack of deeper story or explanation to the gender fluidity and some world building plot holes. 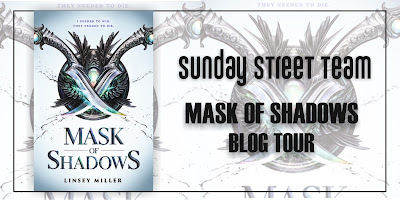 I first saw Mask Of Shadows on NetGalley. A gender fluid YA protagonist? I hadn’t read a fantasy book with someone who identified as gender fluid much less a contemporary novel and so this fact, and the BEAUTIFUL cover, were these unique selling points in my head that made me go: NEED. TO. READ. Sure, I liked the Assassins plot, and the competition to become an assassin but we’ve seen it before. The gender fluidity was supposed to make the book stand out, but it was BARELY TOUCHED UPON. 1. The world building was SO SUB PAR. It started off throwing a few facts at you, when a common thief magically decides to audition to serve the Queen who he/ she/ they “HAS ALWAYS LIKED.” These random facts keep hitting you. Later we find out that Sal’s country was destroyed by “Shadows” (WHAT. HOW. THESE ARE NOT EXPLAINED AT ALL) and Sal lost “his/her WHOLE WORLD” but WHO IS THIS WORLD? From where I sat, Sal had some motivation to do the things he/she/they was doing BUT I WAS NOT EMOTIONALLY INVESTED AT ALL BECAUSE I WAS GIVEN NO DETAILS TO FIND ANY EMOTION. 2. I like that this book was fast paced, all stab stab stab, and not slow like the last book I read (which nearly put me to sleep) and that kept me entertained. The last test, specifically was interesting and it had me hooked. 3. THERE WERE TWO DEATHS THAT WERE SO RIDICULOUS IN THIS BOOK THAT THEY MADE ME CRINGE. Honestly, they were some of my two favourite secondary characters and the manner of death, the way it was described and just WHY annoyed me to no extent. 5. WHY WAS THE COMPETITION SO FAST PACED? If we were going to have Trials AND Classes, don’t these classes have to at least be long enough for the Auditioners to learn and master things, and not for two DAYS each? 6. I felt like the Gender Fluidity could have been handled better. Or actually, handled MORE. It’s an important topic to talk about that I haven’t seen before in books but other than it being mentioned with Sal’s dressing sense THERE WAS NOTHING ELSE about the WHY SAL FELT LIKE THAT or anything. I had some high hoped for this book, I will admit. I give it stars for the fast pace, the fact that there was a lot of killing and that some parts of the plot were very unpredictable, but I WISH IT WAS BETTER and now I want to SOB because it COULD HAVE BEEN. 3 stars. Blurb Description: I Needed to Win.They Needed to Die. A wayward biology student from Arkansas, Linsey has previously worked as a crime lab intern, lab assistant, and pharmacy technician. 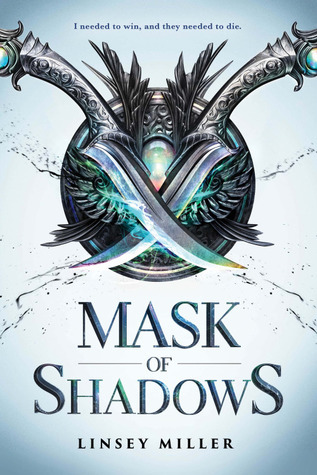 Her debut novel MASK OF SHADOWS is the first in a fantasy duology coming in August 2017 from Sourcebooks Fire. She can be found writing about science and magic anywhere there is coffee.